Gamblers love a good hunch. Considering I’m a gambler, by the associative property of hopefully successful wagering, I also love a good hunch. Perhaps my favorite hunch of all-time came many moons ago on one of my annual, drug-induced visits to Las Vegas. This was a long time ago in a galaxy far, far away. That evening, within minutes of walking through the door, Croshere and I found our travel companion, the Don Calvino, on the dance floor with four young ladies. Calvino was, and still is, never one to shy away from a challenge. It was football season and the girls that Calvino was dancing with all happened to be San Diego State cheerleaders. Their football team was in town that weekend playing UNLV and the girls were pre-gaming at the club to let off a little steam. Among the many lies these girls told Don Calvino that evening, one was not that their football team was horrible. While UNLV had a losing record, the girls assured Calvin that SDSU was as bad as can be. Needless to say, the following day, we placed a wager on UNLV to beat SDSU… and it hit. Whoever said cheerleaders weren’t worth their weight in gold never got a good gambling tip from one. Like I mentioned earlier, hunches come in the most mysterious of ways, sometimes even with a pom pom, but it’s best to trust them when they do. Last New Year’s Eve bears a story of a similar hunch, minus the cheerleaders and Calvino-laden dance ritual. I was wearing my finest tuxedo shirt and bowtie as my humble little pub prepared to ring in the New Year. Every year, on January 1, Tampa is host to the Outback Bowl. There are a ton of parties and a parade right down Ybor City’s 7th Avenue. Fans of both the SEC and Big Ten turn out in hordes to see their teams finish out their season. As these conferences both contain schools with dedicated, traveling fan bases, Tampa becomes overrun with college football fans looking for some post-season action and a break from the weather they’re used to. This year, the Outback Bowl hosted Iowa and Mississippi State. Iowa has played in this game plenty before but hadn’t won it since 2008. It would be 18th ranked Mississippi State’s first ever appearance. The Bulldogs were heavy favorites that day but if college football has taught us anything, on any given afternoon, anything is possible. This would be one of those afternoons. The night before the big game, my bar was overrun with partying Iowa fans, hooting, hollering and most certainly drinking. While Mississippi State Bulldog fans brought their signature cowbells, even they couldn’t drown out the chanting Iowa fans. 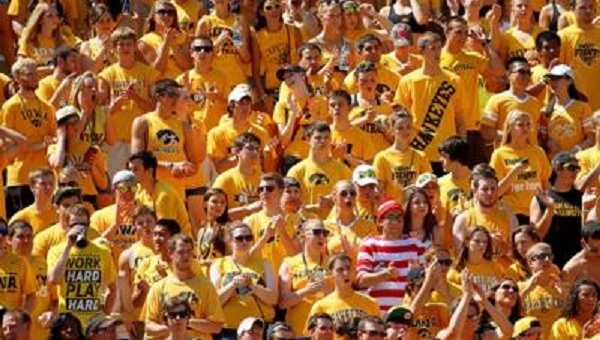 Hawkeye faithful must have outnumbered Bulldog fans four-to-one…. or at least it sounded like it. On a whim, I messaged Milhouse suggesting we place a healthy wager on Iowa. I could only imagine how loud the stadium would be the following day. Iowa was a healthy, seven-point underdog but in a toss-up, neutral field game of this nature, a little home cookin’ is all a team needs to make a difference. Iowa got that difference. I didn’t attend the game but if the ratio of Iowa to Mississippi State fans that day was anything like the one in my bar the evening before, it’s no wonder Iowa pulled out the victory. They did, 27-22, much to the enjoyment of Milhouse’s and my offshore gambling account balance. Fans in attendance would later tell me crowd made all the difference. Go figure. Nothing is ever certain. That’s why they call it gambling. Hunches can turn out to be wrong but there’s something particularly rewarding about placing a wager when you have some quality insider trading, even if it’s on a whim. Recognizing those hunches and acting upon them is entirely up to you. But I’ll be damned if they don’t make cashing in a ticket all the more enjoyable. Kind of like cashing a +1275 ticket on the Suns when they unexpectedly beat the Warriors at home… but that’s a glorious story for another time. This entry was posted in Featured, Life of Sports Chump, Pigskin, Sportsbook and tagged Croshere, Don Calvino, Dr Milhouse, Golden State Warriors, Iowa Hawkeyes, Mississippi State Bulldogs, Outback Bowl, Sportsbook by Chris Humpherys. Bookmark the permalink. Busch Gardens has a lot of customers from Iowa and Wisconsin. Every week, not just the week between Christmas Day and New Year’s Day. And I wonder if Iowa fans will ever learn that the weather gets cold in Tampa. This past December, everyone from Marshall University and the universities in Louisiana were at Busch Gardens, while the weather was cold. That is true. And the nice trick of memory is that the hunches that don’t win are usually quickly forgotten. Go confirmation bias! I don’t know if it ever gets as cold here as it does there, thank goodness. Tampa puts on a good show for that Outback Bowl. I’ve been to the party they throw. If you ever get a chance, I highly recommend it. Dude, remember how cold it was here for the Bama-Clemson national championship game? Oh, I’ve got a few bad beat stories that I can tell… and have. But nobody likes a bad beat story. That being said, ask Richie about the 66:1 future we had on Chris DiMarco the time Augusta beat him at the Masters.